Far More Than Rubies: I'm Back! Hi friends! I even want to say hi to all of those people who I don't know who are reading this blog. I would love to get to know you! Leave a little comment! Ian and I returned from our Rhode Island adventure around 3 this morning., and let me tell you, what an adventure it was! So brace yourself, this might be a long post, if I can keep my eyes open long enough to type it all! On Wednesday afternoon, Ian and I hopped in the car and drove to Orlando. We spent the afternoon running errands around Oviedo that we can't do in Gainesville because it is lacking in alot of the stores that we have gift cards to. Then, that night, Ian dropped me off at girls night while he headed over to see his brothers. I surprised the girls and I think they like the surprise! Spent the evening just getting caught up with my friends and taking in the new dynamics of the group. It's definately different, but I am praying they figure out how to make it a "good" different. Thursday morning, we woke up at my parent's house, ate some delicious cinnamon rolls (thanks mom!) then mom drove us to the airport. No problems with that flight, except that Ian and didn't get to sit near each other because we checked in so late, (we rode with SouthWest.) John (the groom,) picked us up in the pouring rain at the Providence, Rhode Island airport, stopped to pick us up some food, then headed out to the beach house where all of the boys were staying and where the wedding was taking place. Let me tell you, I have never met a more generous, hard working, hospitable person than Mr. Seamus, the owner of the property. He goes by the philosphy of "God has blessed me, so it is my duty and honor to bless others." So his ritzy property is not really his, but all of the people he lends it out to. Pastors, ms, or families going through a rough time are all welcome in his own little northern paradise. Anyways. Thursday afternoon, we spent some time at the beach staying out of the rain and I worked with Onastazia (staz,) and Mr. Seamus' daughter, Christine, to plan, organize, and coordinate the wedding. Staz had a lot of stuff done already, but she also had alot of stuff not done, lol. Christine, Alicia, and I were asked to coordinate and run the reception, for 250 people! 48 hours before it happened! Sheesh. Thursday night, we had rehearsal underneath of the tent in the pouring rain, then headed out to downtown Providence for some Italian food. Something we learned very quickly, is that Staz's family, although being Italian/Greek, hold a similar time management viewpoint that you would expect from a Latin family. We were an hour late to rehearsal dinner. Hmph. Everyone should be forwarned that I eat. All the time. And that I expect to be fed when hungry. Apparently they didn't get that memo. Friday the girls and I all got up and hung out at Staz's house until 1-2, then headed over to the beach house to frantically get the centerpieces made, the drinkware ready, and to go over some last minute details. Friday night was the bachelor/bachelorette parties. The men headed out to a game and fishing club where they ate venison, salmon, and could fly fish. The girls hung out on the DeLuca's back porch, in the garden, eating, talking, and opening presents. Saturday morning, the coordinating girls had to get up super early and drive out to the beach house. We came prepared for a long hard day's work, and boy did we work! From 9-3 we ran around outside, setting up the tables, the linens, the silverware, the plates, the appetizer station, the gift tables, the cake area, the beach/ceremony spot. Then, around 2:30-3 we all kicked the boys out of the master bedroom and showered and dressed as fast as we could. I was one of the first done and ran downstairs to make sure no one messed anything up. Those DUMB ol' caterers had taken every. single. plate. off of the tables, and had stuck all of the menus under the candles and there was just silverware in a jumble EVERYWHERE. I, in turn, gave them a piece of my mind. 15 minutes later I had 3 caterers and 3 of "my people," running around fixing the error, and slamming down yellow napkins with bottled pinapple juice in every which direction. My only regret was that I actually didn't get to see the wedding. You see, there was this little problem, and since most of the girls were already seated in the audience, it was left up to Christine and I to fix it. We noticed it when the bridal party was lining up. The cake was leaning. LEANING! No big deal though, right? I mean, how much can a cake lean on its own? Well, the answer is, only a little before it falls. 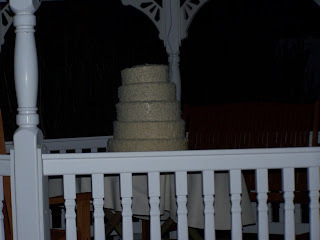 We were chatting with the caterer trying to figure out how to make it stop leaning when she said "OH! I think I just saw it fall!" and we all looked over but the cake looked fine. So I walked over there to inspect it. HOLY CRAP! Two whole layers had catapulted themselves off of the cake onto the table and the floor, leaving a huge hole right on the top, and one whole side was melting away. So, we dd the only thing we could think of. Scrape the icing off of the fallen pieces, with our hands, and shmear it all over the top, trying to make it look a little more normal. Half an hour later, it looked at least presentable, and we crossed our fingers hoping the bride wouldn't notice. How would someone NOT notice a 7 layer cake becoming a 5 layer cake is beyond me. But still. We hoped. The rest of the evening went well, and I made myself sit back and enjoy the reception and let some other people worry about some details for awhile. Ian and I danced, ate, talked, and watched the Greek dances going on. I chatted with the groom's dad for awhile and showed him how smart I was, by beating a bunch of his riddles. Then, around 11, I became exhausted. The bride and the groom left, and then we all rushed around to take down everything we had set up. I was in bed by 1230, and woke up the next morning to a rainy Rhode Island. Ian, Svein, and I cleaned up the beach house (everyone else had left,) and watched several episodes of MonsterQuest on Discovery channel, lol. I learned alot about giant squids, and so did my Norweigan friend. He had a quite a few things to say about the Loch Ness monster too! Ian and I got to the airport at 3 for our 350 flight, but ended up not taking off until 9 because all ofthe planes were grounded due to a horrible storm. We landed in Orlando around 11:30, got our baggage, and our car, and headed for Gainesville. That was our trip! It was very stressful and busy but so great to see all of those people again! 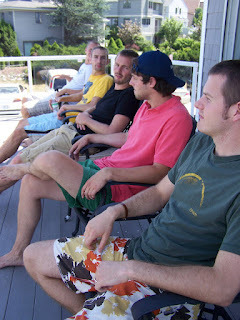 Some of the groomsmen on the Beach house's second story porch. Starting from the right, Ian, John (the groom,) Svein, Eric, and Jake. 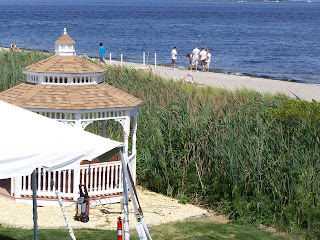 The view of the gazebo, tent, and beach from the porch. 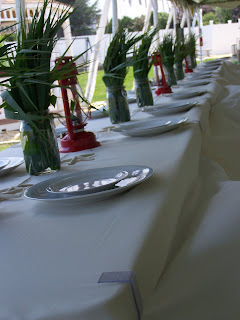 The beautiful head table with my questionably illegal beach grass cuttings. 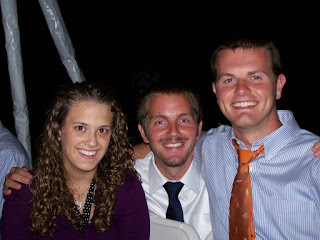 Me, Svein, and Ian at the wedding. I miss that kid! He's off to Toronto then he is going to buy a bicycle (not a motorcycle but a *buy one from target* kind of bike,) and bike the Mississippi River. Crazy kid. The 5 layered cake. See? Not too much of a difference from a 7 layer one , right? Reading all about what you did for everyone up there was amazing.I hope they properly appreciated your helpfulness. Um. I miss you. I see you tomorrow/today. I want to go to Rhode Island (I suppose I'm half Rhode Islandese because of my dad). Reading about weddings makes me miss you even more because that is the last time I saw you!!! P.S. I am sour about the fact that I was not there on account of my dumb knee on girls night! P.P.S. I chuckled at your dynamics of the group comment. I love your writing! You gave me a good laugh!! Did you ever think that with your eye for making things pretty and your organization skills that maybe you could do catering? If a teaching position doesn't open up, it could be a fun possibility! I love how you fixed the cake! The pictures look great! What a beautiful setting for a wedding! I'm glad ya'll had fun! The Vargas Clan loves and misses you! !